If you’ve ever developed an enterprise web application with a relational database then you’re very familiar with the constant data format transformations that need to take place in the middle tier. When retrieving data from a relational database, you are forced to transform the retrieved columns and rows into an XML or JSON document that can be consumed by the requestor. 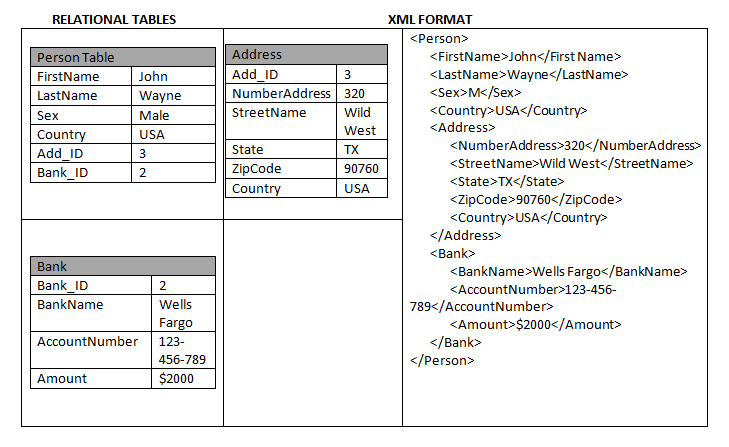 Likewise, if a web service client delivers an XML or JSON document into your application and you need to store the XML or JSON document content, you now need to transform the XML data by mapping it into columns and rows to be inserted into your relational database. As shown above, the XML document to the right can be easily read and understood. In addition, by storing data in a format that can easily be consumed or delivered by various applications and services, the MarkLogic document database allows you to minimize the time and effort spent in transformation processes, greatly simplifying your life as a developer and giving you more time to deliver value to your users and customers.